Traditional country house, tastefully equipped. Not overlooked. 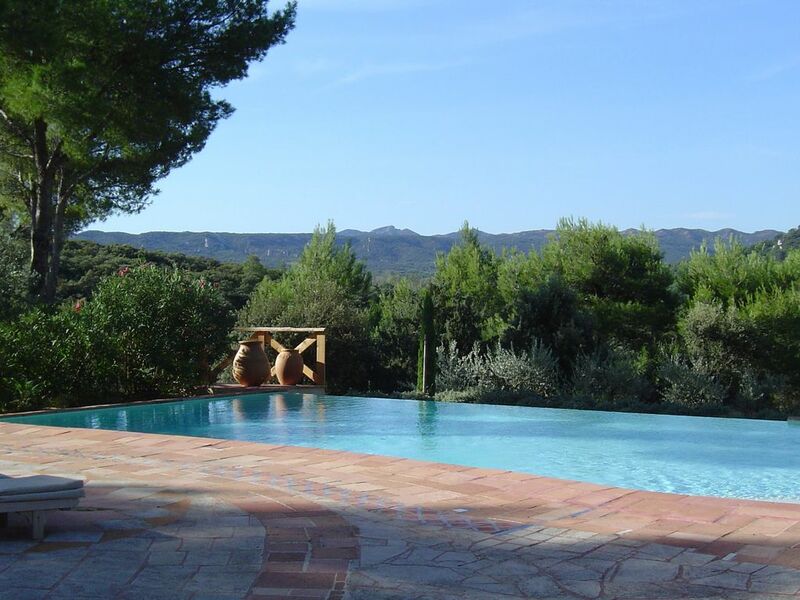 Quiet location on 4 hectares of wild garrigue with pine trees, juniper and green oaks. Stunning view of the Alpilles. Great infinity swimming pool (6 x 12 m) with exterior shower in the pine trees. Barbecue and a teak garden furniture. 10 minutes away from the very nice village of Eygalieres. 15 minutes to Saint-Rémy-de-Provence. 30 minutes to Avignon. 1 hour away from the sea: the calanques of Marseille and Cassis, the Camargue with the beaches of Boduc and Saintes-Maries-de-la-Mer. You find further information on the website of the property if you click on lespassadoiures or on request. The first half of the swimming pool is 1.10 m deep and 2 m in the second. The access is via one of the 3 large round stairs. The house opens to a garden which is landscaped and well-kept throughout the year. The rest of the property is mostly dominated by the unspoilt and wild garrigue above all rosemary, thyme, rock rose, juniper, oak and pine trees. The first half of the swimming pool is 1.10 m deep and 2 m in the second. The access is via one of the 3 large round stairs. The house opens to a garden which is landscaped and well-kept throughout the year. The rest of the property is mostly dominated by the unspoilt and wild scrubland above all rosemary, thyme, rock rose, juniper, oak and pine trees. I was born in Avignon and spent all my childhood in Provence. The family enjoys the region for its climat, the nature, the colours all year, the smells of the vegetation, the small villages, the markets and the local products like vegetables, fruits, cheeses and the big variety of the local specialities. The lively local culture with Arles and its fantastic costumed events. Every shower room has 2 sinks and nice spacious showers of which one is overlooking the scrubland and a small terrace. one of the bathroom has a bathtub. The bathrooms also have lots of storage space for all toiletries. In the living room there are two sofas, a good Hi-Fi stereo system, a DVD player, a large round dining table, many books and maps of the region. On the mezzanine over the living room you'll find a large screen home cinema unit. There is a large table outside and some small extra teak tables as well as some chairs, deck chairs and 3 sun umbrellas. Find the hammock in the scrubland! Boules game. Weber gas grill next to the swimming pool under the terrace. There is also a shower next to the swimming pool. GRANDS PARENTS, FILLE GENDRE ET PETITE FILLE DE 12 ANS, MAISON IDEALEMENT CONCUE POUR RECEVOIR 2 FAMILLES (COULOIR A ANGLE DROIT SEPARANT LES 2 CHAMBRES ET LES DEUX GRANDES S DE BAINS TRES AGREABLES . GRANDE CUISINE TRES BIEN AMENAGEE, GRAND SALON AVEC VUE SUPERBE A 180° SUR LES ALPILLES, ,JARDIN BIEN ENTRETENU, PISCINE AVEC DEBORDEMENT FACE AUX ALPILLES LE REVE. ON ESPERE EN PROFITER LE PLUS LONGTEMPS POSSIBLE. SITUATION IDEALE ENTRE EYGALIERES ET ORGON A L'ABRI DES REGARDS ET DE LA CIRCULATION AVEC UNE VUE IMPRENABLE A 180° SUR LES ALPILLES. LOCATION TRES BIEN ENTRETENUE, DES ECHANGES FORT SYMPATHIQUES AVEC LES PROPRIETAIRES ET LA PERSONNE CHARGEE DE L'ACCUEIL. GDS PARENTS AVEC FILLE GENDRE ET PETITE FILLE DE 12 ANS LA MAISON EST TRES BIEN CONCUE POUR RECEVOIR 2 FAMILLES SANS SE GENER. COULOIR A ANGLE DROIT AVEC DE CHAQUE COTE UNE CHAMBRE ET UNE GRANDE SALLE DE BAINS TRES AGREABLE. UNE CUISINE TRES BIEN AMENAGEE OU IL NE MANQUE RIEN, GRAND SALON DONNANT SUR UNE TERRASSE AVEC VUE SUR LES ALPILLES ET LA PISCINE A DEBORDEMENT COTE ALPILLES. GRAND JARDIN ARBORE... TOUT A ETE BIEN REFLECHI, LE REVE. NOUS Y ETIONS POUR LA SECONDE ANNEE ET AVONS DEJA RESERVE POUR L'ANNEE SUIVANTE. Wir haben das wunderschöne Anwesen zum 2. Mal wieder sehr genoßen. Eines Der beiden Bäder wurde aufwendig stylisch renoviert. Man merkt, daß die Eigentümer das Haus selber nutzen und in Möbel, Dekorationen, Poolliegen etc. stetig investieren. Die Eigentümerin und Monsieur Duval waren wieder sehr zuvorkommend und hilfreich mit Rat und Tat. Wir werden wiederkommen. Google translate: We have the beautiful property again and have enjoyed a lot for the 2nd time . One of the two bathrooms has just been extensively renovated stylishly . You can tell that the owners use the house themselves and are constantly investing in furniture , decorations , pool loungers etc. . The owner and Monsieur Duval were again very accommodating and helpful with advice and support . We will come back. Tolles Haus in idyllischer Umgebung und idealer Lage. Wir haben das Anwesen zwei Wochen lang ausgiebig genossen. Ein sehr guter Bäcker und der neu eröffnete Supermarkt in Orgon sind in weniger als 10 min. zu erreichen. Die Ausflugsziele in der Umgebung sind alle schnell und gut erreichbar. Das Haus ist gut und geschmackvoll ausgestattet und es ist selbst bei kühleren Temperaturen angebehm warm. Bei eventuellen Problemen ist Monsieur Gilles sofort vor Ort. Einmal die Woche kommt eine Putzfrau und ein Gärtner, der sich auch um die Poolreinigung kümmert. Auch der Kontakt zu Mrs. Clark war sehr angenehm und ihre Tipps hilfreich. Dieses Objekt ist uneingeschränkt zu empfehlen, wir kommen wieder! Nous avons passé une semaine magnifique dans cette villa. La propriété est immense, bien entretenue et le premier voisin doit se trouver à 150 mètres. La maison est unique en son genre. Chaque pièce est particulière...et on note une influence différente dans chacune d'elle...Même dans les détails. La piscine offre une vue magnifique sur les Alpilles et les 2 grands pins projettent une ombre bienfaisante autour de la piscine et sur la terrasse. La douche extérieure (chaude et froide) est un régal. De plus nous avons eu une météo très favorable qui nous a permis de profiter chaque jour de la piscine. La personne qui vous accueille est tout aussi sympathique que la propriétaire. La seule chose qui nous a manquée...un terrain pour jouer à la pétanque...sourire. De plus, on va être obligé de revenir...car nous aimerions bien voir la piscine à débordement...dont le système ne fonctionnait malheureusement pas la semaine de notre séjour...mais je suis sûr que ce n'est l'affaire que de quelques jours. Merci pour cette semaine qui nous laissera plus que des souvenirs. D'abord un grand merci pour prendre le temps de rédiger une longue appréciation. Located at the foot of the Alpilles only 5 km away from Eygalieres and close to Saint-Rémy-de-Provence (15 minutes by car), to Les Baux-de-Provence but also to Avignon (30 minutes), to Arles (40 minutes) and the Camargue. On the other side, it is only 40 minutes away from the Luberon with all its glorious villages, 40 minutes from Aix-en-Provence and 1 hour from the calanques of Marseille and Cassis. To get there you can also take the TGV, the train station in Avignon and the Marseille International Airport are both 40 minutes away. The A7 motorway with the Avignon South exit is reachable in 20 minutes. La maison est pour 6 personnes tout est compris sauf la remise en état a regler en fin le séjour pour un montant de 100€. Sont fournis draps et serviettes de toilette. Un accomte de 30% et à verser à la reservation et le solde un mois avant l'arrivée. Les paiements sont à faire par virement bancaire. Une caution de 1000 euros est demandé avant le debut de sejour.